The Barden of Eden is very easy to find. We are located in the heart of Wellington County close to many towns and cities, with an attractive wooded surrounding which feels relaxed and private. Come and see what we can offer you this weekend at our comfortable guest suite in the picturesque Eden Mills. 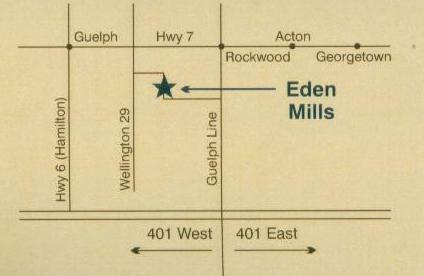 For a map of Eden Mills' location in Ontario click here. By car, head out of the city along Hwy 7/ York Road. Turn Right onto Wellington Road 29. You will see the sign for Eden Mills where you turn Left onto Barden Street. We are the first house on the Right side of the road. Number 169 Barden Street. Heading West on the 401 take the Guelph line exit, head North along Guelph Line for 17 kms until you reach the stop sign which is Wilson Street. Turn Left on Wilson Street, and after 2kms turn Right on York St, then Left onto Barden Street. You will find us as the last house on the Left hand side of the road, number 169 Barden Street. From Kitchener take Kings Hwy 7/ Victoria St North until you reach the Hanlon Expy. Take the Wellington St W exit and turn Left at Wellington St W. Turn Right at Wyndham St S. Slight Left at Kings Hwy 7/ York Rd. Turn Right at Wellington Rd 29. Turn Left onto Barden Street, and we are the first house on the Right side of the Road. number 169 Barden Street. Follow the Queen Elizabeth Way North for 60 Kms. Take ON-403 towards Hamilton-Brantford. Merge onto Kings Hwy 403. Take ON-6 Exit towards Guelph. Merge onto Kings Hwy 6. Continue onto Brock Rd S which becomes Gordon St. Turn Right at Arkell Rd. Continue(becomes) Wellington 37 Rd. then it becomes 30th side road. Turn Left at 1st Line Rd. which then becomes Wellington Rd 29, and turn Right onto Barden St. We are located in the first home on the Right. This is a very nice country drive which takes about one and a half hours from the heart of Niagara or an hour from Hamilton.